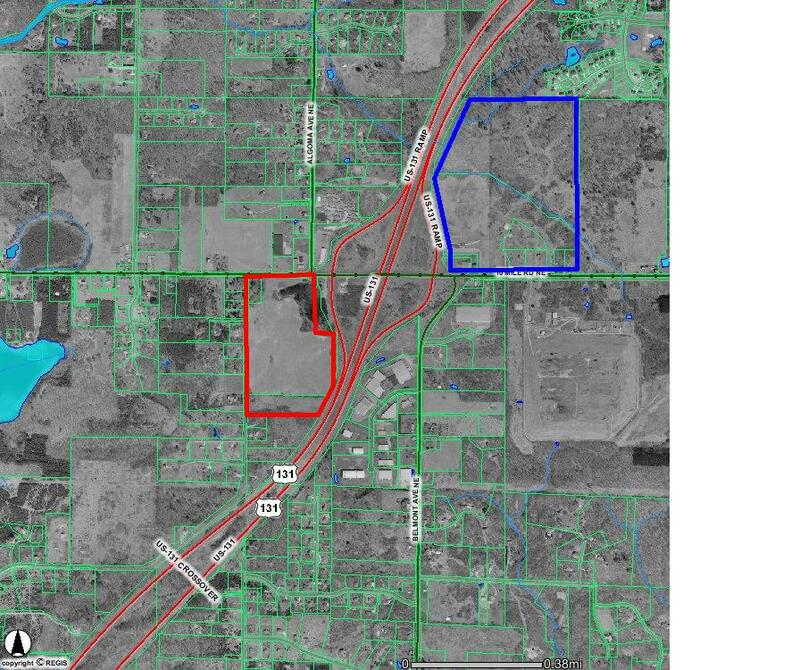 ALGOMA TOWNSHIP -- A developer's vision for a massive retail center near the Rockford Meijer store calls for 3,150 parking spaces around an unnamed "retail super center" flanked by a home improvement store and 22 smaller commercial buildings. "Overwhelming" is how Donald Bates, the building official for Algoma Township, described the project. Jay Barnes, the developer, sees the proposed complex as a spark plug for the region's economy. Here we go again. Anyone want to place wagers as to who the main tenant is they are looking at getting? I don't know if in the long run building more retail projects "spurs the economy". I just read that the Detroit Metro area has added 12 million square feet of retail in the past few years. It doesn't seem to have helped them much, if at all. I wonder what this says about our economy? Whether this comes about or not, obviously someone thinks we can support another one of these large retail developments. The land outlined in red is in Plainfield Township (10 Mile Road is the boundary line). I believe the parcel in question is to the east of Meijers. It's in the correct township I'm pretty sure that's the parcel. Interestingly, before Meijers went in, it was proposed for a residential development but never went forward. IIRC, the neighbors fought it over density (among other things - traffic, crime, home to wildlife, etc, etc, etc) . I want to say Cross was the developer. My first reaction when I saw the words "retail super center" I was thinking oh lord, another walmart. So what do you think it could be? The only thing I could think of is Target? I don't see that this proposal reflects our econonmy whatsoever. To me this is the Rivertown process over again. Whoever builds first wins the race. I don't see this particular project, the multiple lifestyle centers, the proposed Walker development all getting built. One, maybe two get finished. However, I see it as more as a distribution of retail dollars with all the SQ footage being added rather then adding to what in this market I feel is an already saturated retail market. Metro GR is not generating or increasing wealth at a rate to support all of these developments. I agree. The first thing I thought of was another Cabela's/Bass Pro Shops proposal. 3500 parking spots is a lot of parking. They may smell blood in the water in Walker, and are trying to get a competing development going. 3,150 spaces at 5 cars / 1,000 SF = 630,000 SF. WalMart is 220,000 SF (?) so the 22 smaller buildings will average about 20,000 SF. Sounds like a classic power strip. I'm betting a Walmart supercenter is the heart and soul of this proposal. Some say that Rockford will reject Wal-Mart to which I hope they do. However Wal-Mart is in the mist of remaking its image to appeal to clientel that would choose to shop at a more hip retailer like Target. So Wal-Mart would not be out of the question. Speaking of Target, they too would be a likely main draw for this proposal as the people of Rockford falls smack dab in the mist of the demographics Target aims for. Thus if Wally World is not the "unnamed retail supercenter" a Target Greatland or a Super Target store would be likely. I'm betting a Walmart supercenter is the heart and soul of this proposal. Some say that Rockford will reject Wal-Mart to which I hope they do. One simply needs to read the full article to realize that this is not a new proposal, simply another attempt by Encore to keep their original idea alive somehow. If they are hoping to achieve a compromise via repeated end-arounds, lawsuits or other shenanigans, they will quickly learn (since they clearly haven't yet) that they face a very committed trio of municipalities who have all fervently agreed to the current land use plan for that corridor. I wouldn't get any of our undies in a bunch just yet over this pipe-dream of a project. The ignorance that Encore's representative displayed in his comments in the article regarding Rockford's retail "needs" further bolsters my confidence that this has little chance of becoming reality. If Meijer indeed owns the water main, than Meijer could keep its competitiors out by refusing to share services. No Target and no Wally World. Thus no retail center. But it's a city water main that Meijer negotiated with Rockford. I'm pretty sure the City will have something to say before letting anyone else tap into that line. "If" the proposed development here actually occurs, I would think that Meijer would be satisfied to have Target as an anchor if and only if its not a SuperTarget. Just an update: the Algoma ZBA denied Encore's request this week. The Encore rep was quoted as saying he viewed the ZBA denial as merely a formality (before they elevate to lawsuit levels). It amazes me how brazen these developers can be in the face of such overwhelming opposition. This one faces no less than the combined clout of three municipalities AND Meijers (who has some control over who can tap into utilities in that area). As a party to the 10 Mile Corridor Overlay Committee, I can assure you there is vast opposition to this development. Seems a shame they're willing to spend money on attorneys instead of appropriate development. Just an update: the Algoma ZBA denied Encore's request this week. The Encore rep was quoted as saying he viewed the ZBA denial as merely a formality (before they elevate to lawsuit levels).